Was just reading your blog. Do you happen to have the contact for the gentleman named Bill that wrote in about fixing his Delivery with a 4 door? I may need to do something similar. Thanks! I expect that he won't have a problem with me giving you his contact info, but I will check with him first and get back to you. 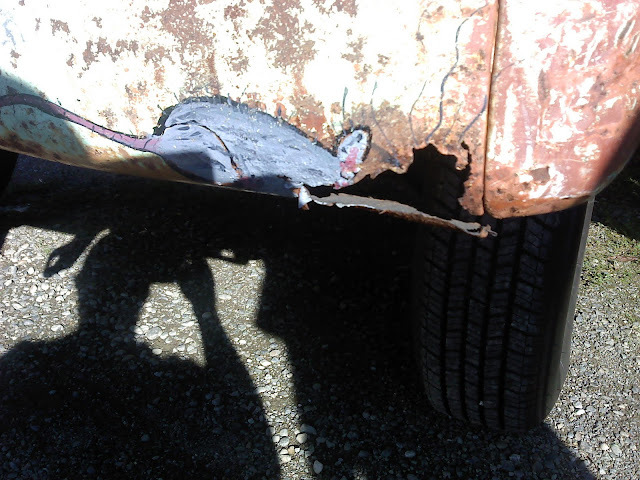 Rat Rods can be fun and humorous. Getting a little carried away sometimes with the ridiculous is not uncommon either, but this one made me chuckle. I had to stop and take a picture with my phone camera. This Rat Rod was at this year's Shake The Shack rockabilly ball, car, hot rod and motorcycle show at the Shanty Tavern in Seattle. Normally when you talk about a rat hole, you are referring to cash you have put away in your rat hole account. It's not a good idea to put it in an actual rat hole cause the rats will likely shred it for you. It's just a figure of speech. There was a good showing of street rods, hot rods, rat rods, vintage cars and trucks, and a lot of nice motorcycles. 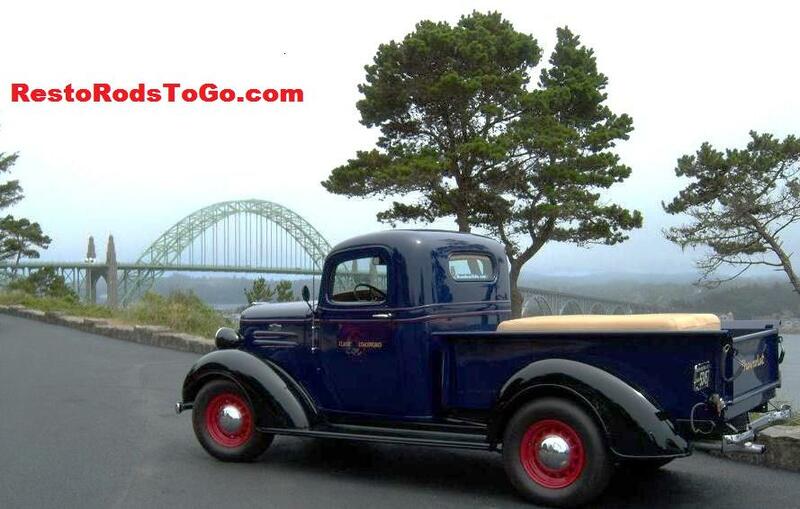 I don't normally burn my tires on my 1937 Chevy Truck, but the mood was right when I left the show that day. It's sometimes kinda fun to hear that six cylinder, dual exhaust cackle along with the sound of the squealing tires. 1958 Style Hot Rod with turn signals that aren't offensive or cluttering. 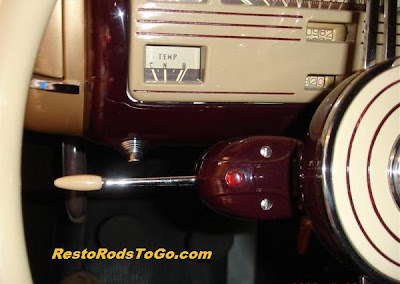 Some use the Guide 682-C headlights on their hot rods and those are in my opinion the least offensive turn signal lights for a traditional hot rod if you don't already have separate park lights on your original vehicle. If you have, you can easily install dual filament sockets in place of the singles. Some install an amber dual light bulb inside the headlight where the original park light is, or install lights inside the horn. I however chose a different route on this 1936 Ford that I built in the 1958 theme. I chose to use turn signals only on the back, figuring that you can see what's going on in front of you and really don't need the lights up front, especially on a car that didn't come with turn signals in the first place. On the back however, we improved the visibility of the lights by using vintage period correct aftermarket Night Owl lenses. 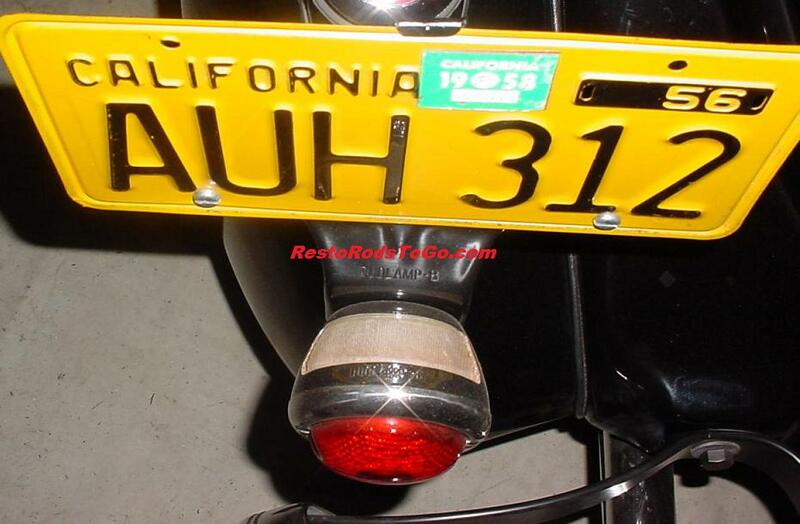 They were produced for trucks and acted as side marker light,as well as the tail light, prior to actual separate lights specifically for that purpose. These are quite rare and hard to obtain, however. If you know how turn signals operate, you are probably wondering at this point how I was able to make turn signals work on just the rear. It's another little trick I thought up in order to overcome a relativity simple obstacle in the whole picture of this fabulous car. I took the flasher apart and just did a little tweaking on the flasher until it started flashing with just one light drawing juice through it. I call these General Jumbo Wheels Because that is what they are most often called. 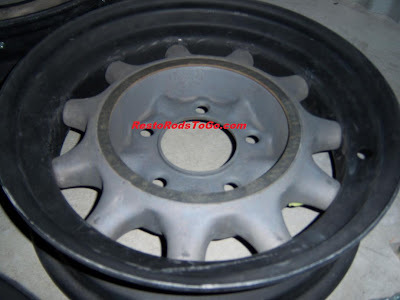 The reality of it is that these are Wheels that were made by Cleveland Welding Co. and these eleven spoke wheels were produced for Goodrich Tire Co.
Because the 11 spoke wheels are more of a refined look than the 9 spoke wheels that General Tire Co. used, we are modifying these to take the General caps. No one that I know of ever reproduced the Goodrich caps which were made to snap onto a clip ring that was spot welded to the rim center. The caps for Goodrich were larger in diameter too. 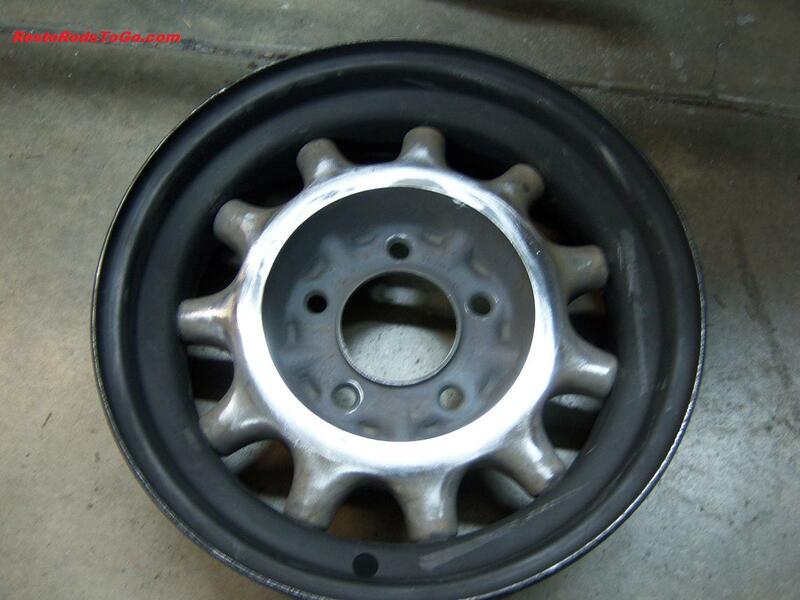 These wheels are far more complicated to restore than the 9 spoke because of the way the center was constructed. The rivets were drilled out of the rims and a large portion of the rivet fell inside the spokes. 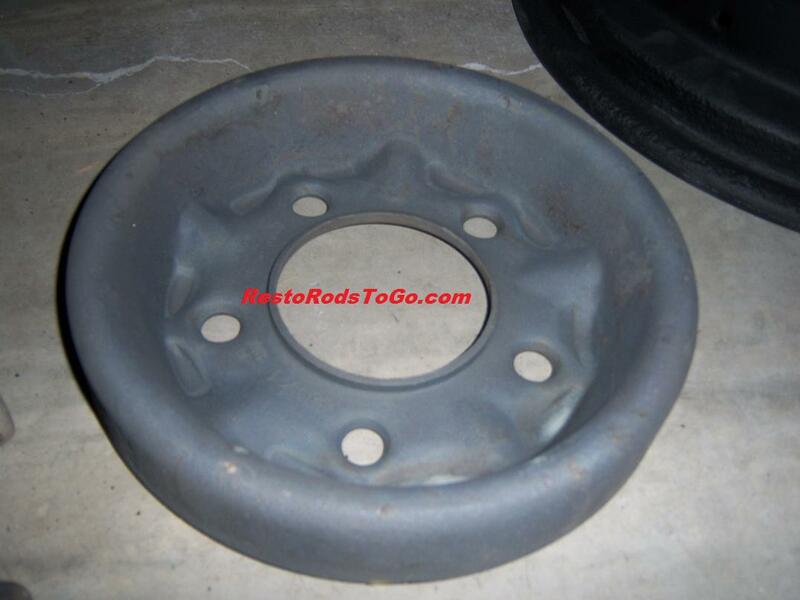 That was when we realized that we would have to cut the center out of the spoke section. They had a bit of rust inside them making them hard to press apart after the centers were cut at the weld on the lathe. We had all the pieces sandblasted and installed 1/4 inch nutserts in each spoke so we could refasten the spoke section to the rim without welding after the center section is chromed. Originally they just burned some of the chrome off the back side after riveting them into the rims, and just painted it with some silver paint to cover the burn. We are putting wider rims on the pair for the rear so the holes for the spokes will have to be indexed by our machinist. After we install the spoke centers in the rims they will be set up in the lathe again and the lug bolt plate will be welded into place. 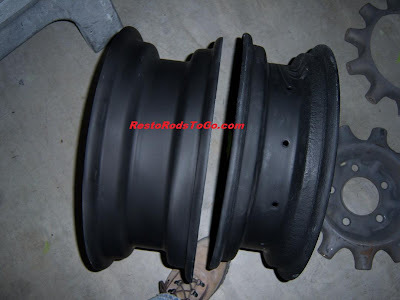 Also the adapter ring on the face so they will accept the General caps, will be welded at this time. The next step will be to remove the centers again and copper and file and sand until they are ready to polish for the final chrome finish. Installing the chrome centers and painting the rims black is the final step in this complex project. 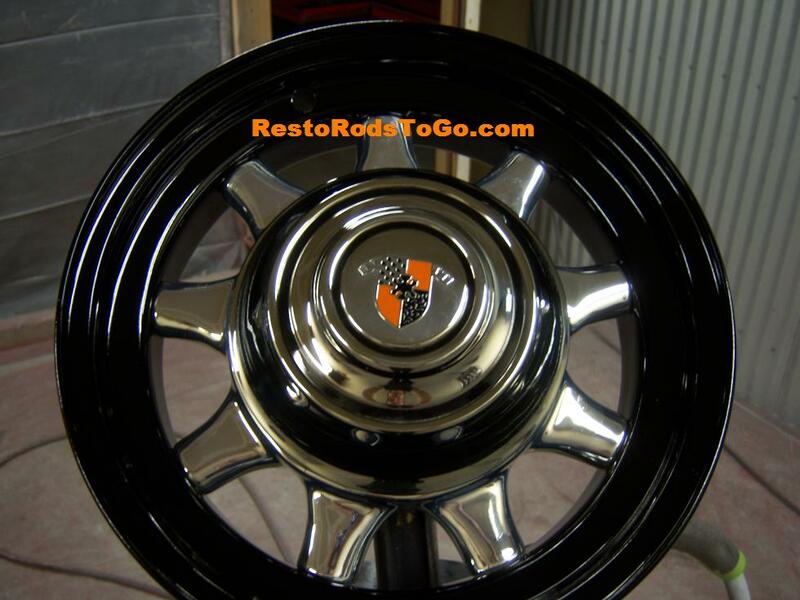 The results will likely be proud ownership of what will probably be the only set of these wheels that have ever been restored. 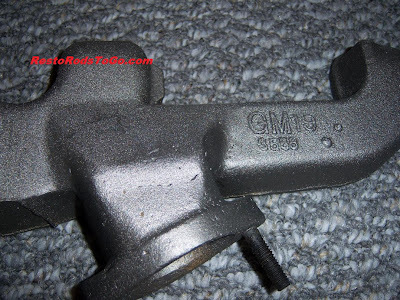 A split manifold on a stove bolt Chevrolet 235 or 261 engine makes for a unique sound and increases breathing capacity, therefore slightly increasing horsepower. The early Corvette came with what was called the Blue Flame Six. It had the dual exhaust manifold and three side draft carburetors. Through the years, there have been a lot of standard manifolds split, and they were done in a wide range of fashion. Sometimes done with a plumbing elbow, just scabbed onto the side of the manifold with just an extra hole exiting the manifold. 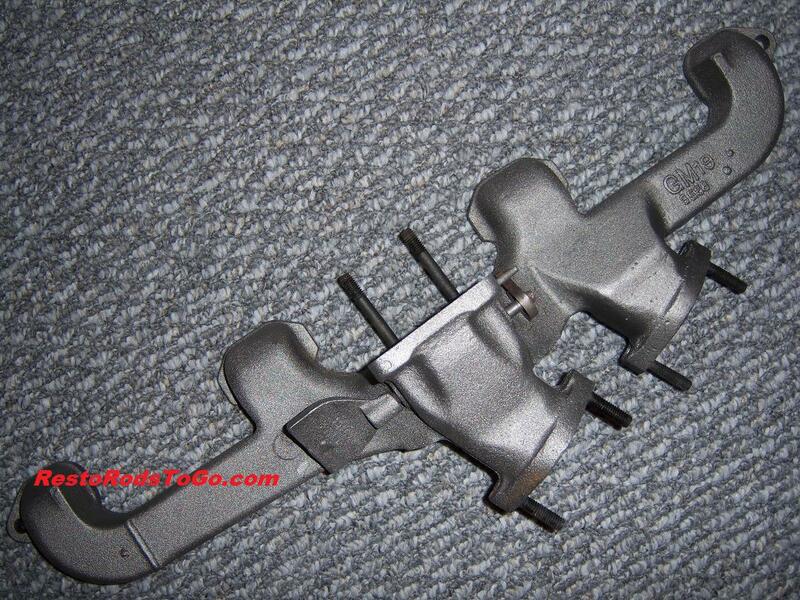 There was a rear section offered for splitting the manifold that was actually a separate cast manifold. You would cut the original manifold just behind the heat riser and block it off at that point, making the process quite simple. These are quite rare to find, but make for a nice vintage correct look and are of pretty nice quality, although they don't really look like they match when finished. 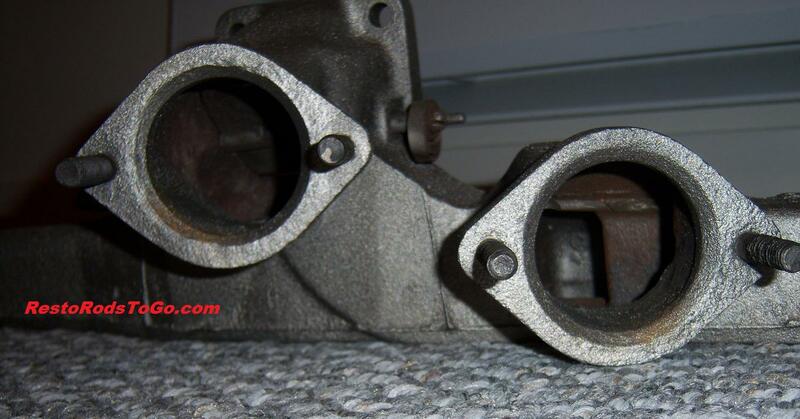 I have an example here of a very nice original 235 manifold that has been split, using an original flange from another manifold. It has also been blocked off just behind the heat riser so as to make two separate chambers. 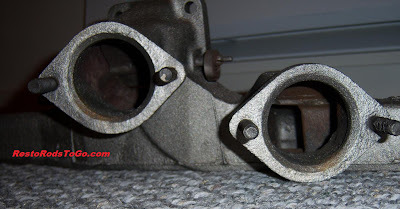 In making two separate chambers, it gives the exhaust a definite cackle. 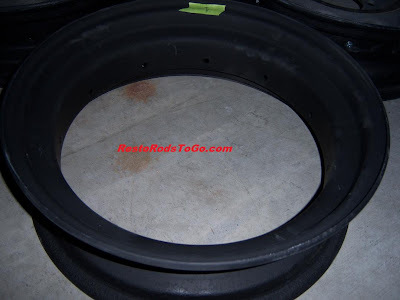 If you have pressure equalizing between the chambers, it softens the sound greatly. The welding of the cast iron is a tricky process. 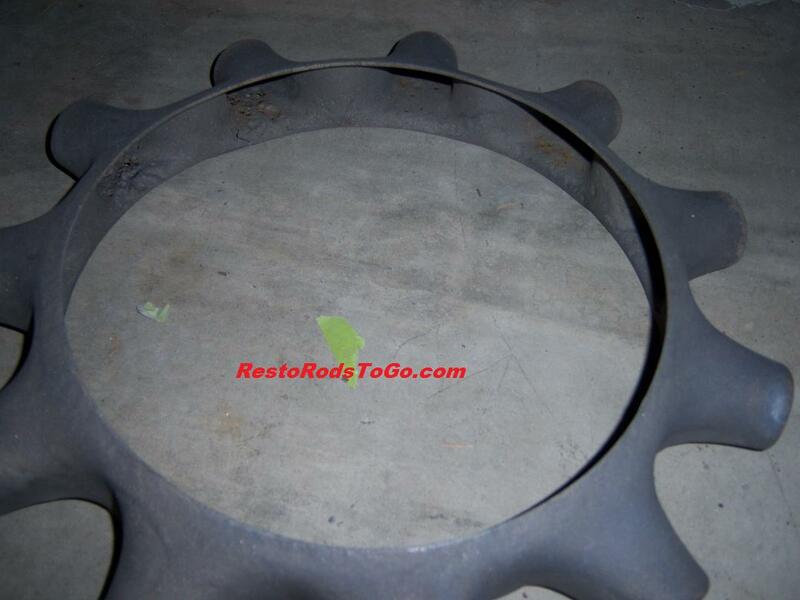 It is best done in conjunction with an oven for preheating and controlled slow cooling after the weld is done. It can be done by Brazing, cast iron welding or nickel allow welding. Keeping the manifold bolted to a head with the intake in place as well, provides for a great jig to prevent warping. This example here has a very nice tight shaft for the heat riser, with almost no wear on it. Because it is quite an involved process to do a manifold like this, it is not worth the trouble to split one that is not in excellent condition. This one was welded together with nickel alloy rod. A final finish of VHT cast iron paint was applied. This coating holds up very well. I used it on my 1937 Chevy pickup manifold, several years and 30,000 miles ago.